10 A None No Power Seat 10 A is a standard Economy Class seat that may have slightly restricted legroom. It can get cold by the exit doors during flight. 10 B None No Power Seat 10 B is a standard Economy Class seat that may have slightly restricted legroom. It can get cold by the exit doors during flight. 10 C None No Power Seat 10 C is a standard Economy Class seat that may have slightly restricted legroom. It can get cold by the exit doors during flight. 10 D None No Power Seat 10 D is a standard Economy Class seat that may have slightly restricted legroom. It can get cold by the exit doors during flight. 10 E None No Power Seat 10 E is a standard Economy Class seat that may have slightly restricted legroom. It can get cold by the exit doors during flight. 10 F None No Power Seat 10 F is a standard Economy Class seat that may have slightly restricted legroom. It can get cold by the exit doors during flight. 11 A None No Power Seat 11 A is a standard Economy Class Stretch Seat. Stretch seats are standard Economy class seats but feature up to 8 inches of additional legroom. Stretch seating is included with Classic Plus tickets or may be purchased at time of check-in or at the airport. This seat may have extra legroom due to the exit in front however, It can get cold by the exit doors during flight. There is no floor storage during takeoff and landing. 11 B None No Power Seat 11 B is a standard Economy Class Stretch Seat. Stretch seats are standard Economy class seats but feature up to 8 inches of additional legroom. Stretch seating is included with Classic Plus tickets or may be purchased at time of check-in or at the airport. This seat may have extra legroom due to the exit in front however, It can get cold by the exit doors during flight. There is no floor storage during takeoff and landing. 11 C None No Power Seat 11 C is a standard Economy Class Stretch Seat. Stretch seats are standard Economy class seats but feature up to 8 inches of additional legroom. Stretch seating is included with Classic Plus tickets or may be purchased at time of check-in or at the airport. This seat may have extra legroom due to the exit in front however, It can get cold by the exit doors during flight. There is no floor storage during takeoff and landing. 11 D None No Power Seat 11 D is a standard Economy Class Stretch Seat. Stretch seats are standard Economy class seats but feature up to 8 inches of additional legroom. Stretch seating is included with Classic Plus tickets or may be purchased at time of check-in or at the airport. This seat may have extra legroom due to the exit in front however, It can get cold by the exit doors during flight. There is no floor storage during takeoff and landing. 11 E None No Power Seat 11 E is a standard Economy Class Stretch Seat. Stretch seats are standard Economy class seats but feature up to 8 inches of additional legroom. Stretch seating is included with Classic Plus tickets or may be purchased at time of check-in or at the airport. This seat may have extra legroom due to the exit in front however, It can get cold by the exit doors during flight. There is no floor storage during takeoff and landing. 11 F None No Power Seat 11 F is a standard Economy Class Stretch Seat. Stretch seats are standard Economy class seats but feature up to 8 inches of additional legroom. Stretch seating is included with Classic Plus tickets or may be purchased at time of check-in or at the airport. This seat may have extra legroom due to the exit in front however, It can get cold by the exit doors during flight. There is no floor storage during takeoff and landing. 12 A None No Power Seat 12 A is a standard Economy Class Stretch Seat. Stretch seats are standard Economy class seats but feature up to 8 inches of additional legroom. Stretch seating is included with Classic Plus tickets or may be purchased at time of check-in or at the airport. Passengers will be charged extra for this seat as it is a Stretch Seat. 12 B None No Power Seat 12 B is a standard Economy Class Stretch Seat. Stretch seats are standard Economy class seats but feature up to 8 inches of additional legroom. Stretch seating is included with Classic Plus tickets or may be purchased at time of check-in or at the airport. Passengers will be charged extra for this seat as it is a Stretch Seat. 12 C None No Power Seat 12 C is a standard Economy Class Stretch Seat. Stretch seats are standard Economy class seats but feature up to 8 inches of additional legroom. Stretch seating is included with Classic Plus tickets or may be purchased at time of check-in or at the airport. Passengers will be charged extra for this seat as it is a Stretch Seat. 12 D None No Power Seat 12 D is a standard Economy Class Stretch Seat. Stretch seats are standard Economy class seats but feature up to 8 inches of additional legroom. Stretch seating is included with Classic Plus tickets or may be purchased at time of check-in or at the airport. Passengers will be charged extra for this seat as it is a Stretch Seat. 12 E None No Power Seat 12 E is a standard Economy Class Stretch Seat. Stretch seats are standard Economy class seats but feature up to 8 inches of additional legroom. Stretch seating is included with Classic Plus tickets or may be purchased at time of check-in or at the airport. Passengers will be charged extra for this seat as it is a Stretch Seat. 12 F None No Power Seat 12 F is a standard Economy Class Stretch Seat. Stretch seats are standard Economy class seats but feature up to 8 inches of additional legroom. Stretch seating is included with Classic Plus tickets or may be purchased at time of check-in or at the airport. Passengers will be charged extra for this seat as it is a Stretch Seat. 27 C None No Power Seat 27 C is a standard Economy Class seat, however the proximity to the lavatories may be bothersome. 28 A None No Power Seat 28 A is a standard Economy Class seat in the last row of the aircraft. The proximity to the lavatories may be bothersome. 28 B None No Power Seat 28 B is a standard Economy Class seat in the last row of the aircraft. The proximity to the lavatories may be bothersome. 28 C None No Power Seat 28 C is a standard Economy Class seat in the last row of the aircraft. The proximity to the lavatories may be bothersome. 28 D None No Power Seat 28 D is a standard Economy Class seat in the last row of the aircraft. The proximity to the lavatories may be bothersome. 28 E None No Power Seat 28 E is a standard Economy Class seat in the last row of the aircraft. The proximity to the lavatories may be bothersome. 28 F None No Power Seat 28 F is a standard Economy Class seat in the last row of the aircraft. The proximity to the lavatories may be bothersome. 4 A None No Power Seat 4 A is a standard Economy Class Stretch Seat. Stretch seats are standard Economy class seats but feature up to 8 inches of additional legroom. Stretch seating is included with Classic Plus tickets or may be purchased at time of check-in or at the airport. This seat may have limited to no recline. 4 B None No Power Seat 4 B is a standard Economy Class Stretch Seat. Stretch seats are standard Economy class seats but feature up to 8 inches of additional legroom. Stretch seating is included with Classic Plus tickets or may be purchased at time of check-in or at the airport. This seat may have limited to no recline. 4 C None No Power Seat 4 C is a standard Economy Class Stretch Seat. Stretch seats are standard Economy class seats but feature up to 8 inches of additional legroom. Stretch seating is included with Classic Plus tickets or may be purchased at time of check-in or at the airport. This seat may have limited to no recline. 4 D None No Power Seat 4 D is a standard Economy Class Stretch Seat. Stretch seats are standard Economy class seats but feature up to 8 inches of additional legroom. Stretch seating is included with Classic Plus tickets or may be purchased at time of check-in or at the airport. This seat may have limited to no recline. 4 E None No Power Seat 4 E is a standard Economy Class Stretch Seat. Stretch seats are standard Economy class seats but feature up to 8 inches of additional legroom. Stretch seating is included with Classic Plus tickets or may be purchased at time of check-in or at the airport. This seat may have limited to no recline. 4 F None No Power Seat 4 F is a standard Economy Class Stretch Seat. Stretch seats are standard Economy class seats but feature up to 8 inches of additional legroom. Stretch seating is included with Classic Plus tickets or may be purchased at time of check-in or at the airport. This seat may have limited to no recline. 6 D None No Power Seat 6 D is a standard Economy Class Select Seat. Select seats are standard Economy class seats but feature up to 2 inches of additional legroom, however, this seat may have limited underseat leg and storage room due to the presence of an entertainment equipment box. 8 D None No Power Seat 8 D is a standard Economy Class Select Seat. Select seats are standard Economy class seats but feature up to 2 inches of additional legroom, however, this seat may have limited underseat leg and storage room due to the presence of an entertainment equipment box. 9 A None No Power Seat 9 A is a standard Economy Class Select Seat. Select seats are standard Economy class seats but feature up to 2 inches of additional legroom. 9 B None No Power Seat 9 B is a standard Economy Class Select Seat. Select seats are standard Economy class seats but feature up to 2 inches of additional legroom. 9 C None No Power Seat 9 C is a standard Economy Class Select Seat. Select seats are standard Economy class seats but feature up to 2 inches of additional legroom. 9 D None No Power Seat 9 D is a standard Economy Class Select Seat. Select seats are standard Economy class seats but feature up to 2 inches of additional legroom. 9 E None No Power Seat 9 E is a standard Economy Class Select Seat. Select seats are standard Economy class seats but feature up to 2 inches of additional legroom. 9 F None No Power Seat 9 F is a standard Economy Class Select Seat. Select seats are standard Economy class seats but feature up to 2 inches of additional legroom. The configuration on this aircraft is identical to the A319 in the Frontier fleet but has additional capacity. This aircraft features Frontier's Stretch seating which are the first four rows of the cabin. These rows provide an extra 5 inches of legroom and may be selected at time of purchase or at check-in. These seats are free with the Classic Plus fare; $5 USD per segment for Classic fares; and $15 USD for Economy fares. Stretch seating is increased legroom but remains an Economy class product. It has also been reported that none of the seats on this aircraft recline. Although this seat is a "premium" or one of the best seats on the plane, the leg room is still very minimal and you're stuffed in like sardines! Islip to Miami - Seats were soft and comfortable in the Economy Class. It was a 3 hour flight and we did not feel any fatigue after the 3 hour flight. This is my first experience on a low cost airline flying from Islip to Miami. Frontier Airlines is like a Pre-paid Cell Phone Carrier. You only pay for the services you need as you go. "Pre-paid Services with Low Fares Done Right". I never knew you can purchase a round trip to Florida under a $100 dollars and then if you book your checked baggage online at the time of booking it was only $25 dollars per bag. You get the best rates at the time of booking. We had the best flight experience during our trip. Staff were professional, you pay for what you want (snacks and drinks), and the flight experience was great. The only improvement I would recommend is to install an inflight information screen with a choice for Pre-Paid Entertainment and to offer Sandwiches on the airline. If they have these services, it would have been the best experience. You just have to bring your own device for that for now if needed especially when you have kids. I would definitely recommend this airline to everyone. Our family enjoyed our trip. I have been flying for over 40 years, and this by far is the worse airline I have ever flown on, delay after delay.................. and do they tell you computer glitch, sure doesn't make you feel good about that, this is a full computerized plane, what happens if glitches in flight, do you have time to kiss your axx good bye? Seats are garbage, may as well throw a blanket on a concrete park bench and try sitting cramped for 4 to 5 hours to see what its like. Did I mention they charge you for EVERYTHING, drinks, carryon bags, unless you pack a small backback that fits under the seat, I'm sure they'll soon charge for that too. You'v been warned. As people have said, these seats DO NOT RECLINE and they are HARD. My friend and I measured less than 1/8 inch padding. I have severe Fibromyalgia and was in agony for 4.5 hours. My friend and I are both 5'8" and 175 lbs-not large guys. Thankfully we dont mind touching each other because there is NO ROOM. We new this was an Ultra Low Cost Carrier going into it. What we did not expect was the brutal discomfort on a flight from Tampa to Las Vegas. I fly Frontier often because of the great rates I get from Tampa or Orlando to Las Vegas. I ALWAYS sit in stretch seating, 2C or 2D, and have never had an issue with legroom. The seats themselves are HORRIBLE- but I bring a memory foam seatcushion with me (rolls up and fits into my backpack), and I am then more than comfortable for the 4+ hour flight to Vegas. I did the flight once without my seat cushion, and I would not recommend it to anyone that way! But for the price, purchasing The Works- getting your choice of Stretch Seating, Bag Fees, Refundability, and Zone 1 boarding... it's totally worth it. You do have to pay for snacks on board, but they are very reasonable. I have always had very friendly flight crews, and customer service has been great. The biggest problem I see is that people are expecting first class accommodations and service for minimal pricing. If you are expecting that- don't fly Frontier. They don't lie- all of their fees are very clearly stated. If you don't want to bring a bag, you don't pay for one. If you don't care where you sit, don't pay for a seating assignment. You can realistically fly to Las Vegas bringing one backpack round trip for $130. So if you get hit with fees, it's because you didn't do your homework- meaning- you didn't read the website. I like Frontier the way it is. Let me add my "Works" package and pay less than $300 round trip for Stretch Seating to Vegas, and I'm happy. You still can't find non-stop service on any other airline out of Central Florida for this price. And Southwest can take their crazy boarding routine and shove it. I'll fly Frontier any day over that mess!!! Worst airline seating possible. I paid for stretched seating, two seats to be exact due to my fiancé being overweight. Well I clearly asked if the seats were larger, the young lady stated yes and proceeded to tell me the space meaning inches between seats had leg room up to 30 something inches. . My sane mind should have kicked in or better yet i should say if you're going to extend something longer, why wouldn't you extend it wider? That sounds sane to me. Needless to say no big seats like othr airlines and i paid $100 combined to sit uncomfortable but yet extennd my leg. This airline is not for overweight people. I had three back surgeries and I'm 155lb and I was uncomfortable in the seating. Absolutely no recline, who designed this mess.oh well you get what you pay for...buy cheap and fly miserable. If you are smart, you reduce the add ons as best you can. For three of us, we paid for one large checked bag for $35 instead of three carry ons on $35 each and took under seat bags for free. Flew TTN-ORD and return. 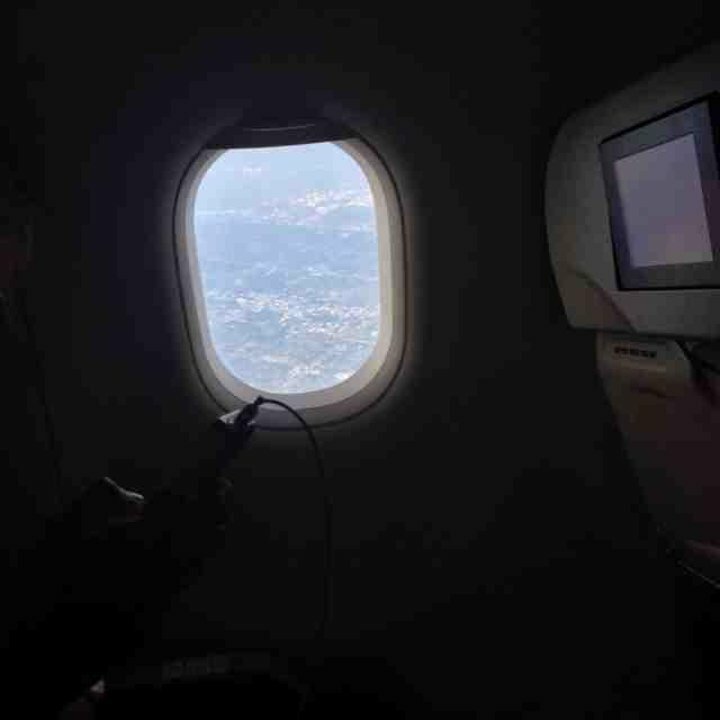 Seats cramped, no recline, but all in all, plane was fine, seemed new, and that trip and return were on time. Flew it since Trenton is a breeze to get in and out of. None of the seats on the plane recline, but they are all "pre-reclined" with the exception of this row, which has absolutely no recline. 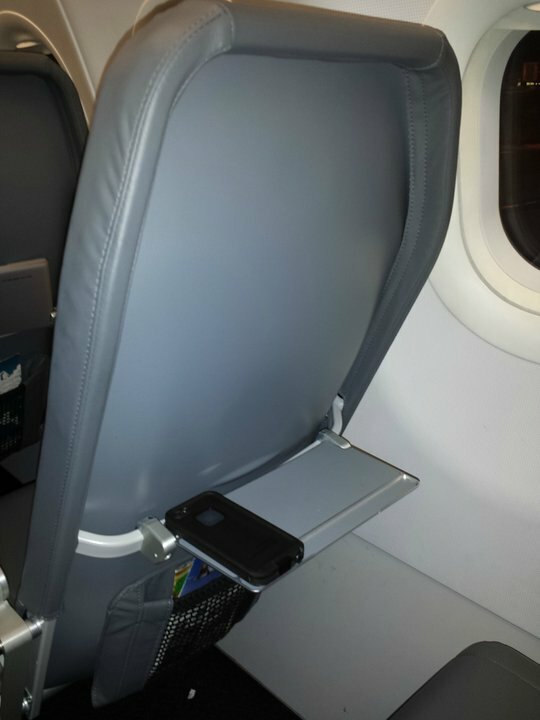 All Frontier flights now feature seats that don't recline, are quite tight (unless you get an exit row or stretch seating), have small metal trays and cost extra $ to choose a seat--anywhere from $3 when you book the flight and up to $24 for the front section or $45 for stretch. Prices may vary by length of flight and how soon you pay for a seat. BUT, if you wait until 24 to 2 hours before flight time, they will assign you a seat for free upon check-in, online or at the airport. The secret is timing your check-in to the point that only seats you want are available. I generally start checking the seat selection 24 hours before fight time, then every few hours thereafter. If a single seat is open in back, you'll get it so they can sell the other ones up front. If you are traveling with someone else on the same reservation, then they will seat you together assuming any seats are open together-even the more expensive seats up front in rows in front of the wing exit row. This once even worked at the airport as we checked a suitcase 2 hours before departure. It's a gamble that can pay off and give you a good seat without paying for it. Don't waste your time on Frontier Airlines. They charge you for every seat on the aircraft. Frontier is really going downhill. I'd rather fly on American Airlines and get as much cranapple cocktail that I want for free in Economy. The photos show two kinds of seats. one has a TV screen while the other shows no TV screen and a tray table that's smaller than an iPad. Sadly, the current seats are the second one. I can hardly have a decent snack with this tray table. A little other note, all of the odd numbered rows (except for Stretch seating) has a misaligned window. I have to lean forward and hit my head against the next seat, or lean my head back to where it's interfering with the person in the seat behind me. 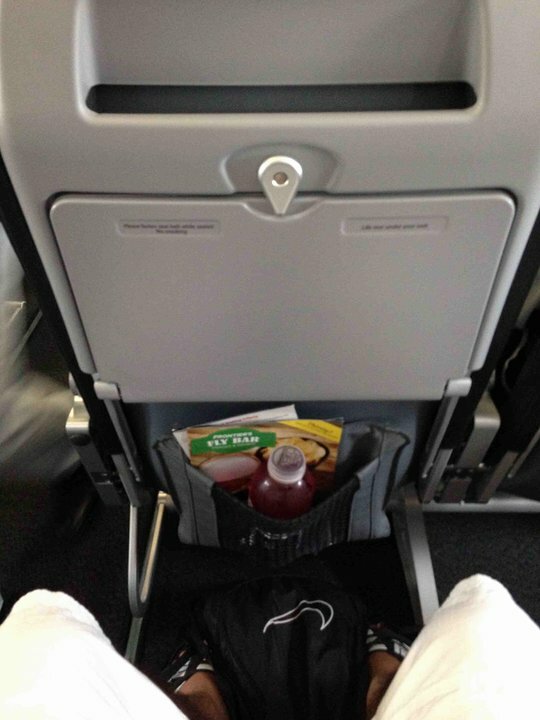 The ONE thing that is good is the legroom. I'm 5'7" and I have lots of space to stretch. I am 6' 2". With my rear to the back of the seat, my knees were barely touching the seat in front. The seats are hard plastic with a little padding on the seat and less on the back. They are all fixed, no reclining. 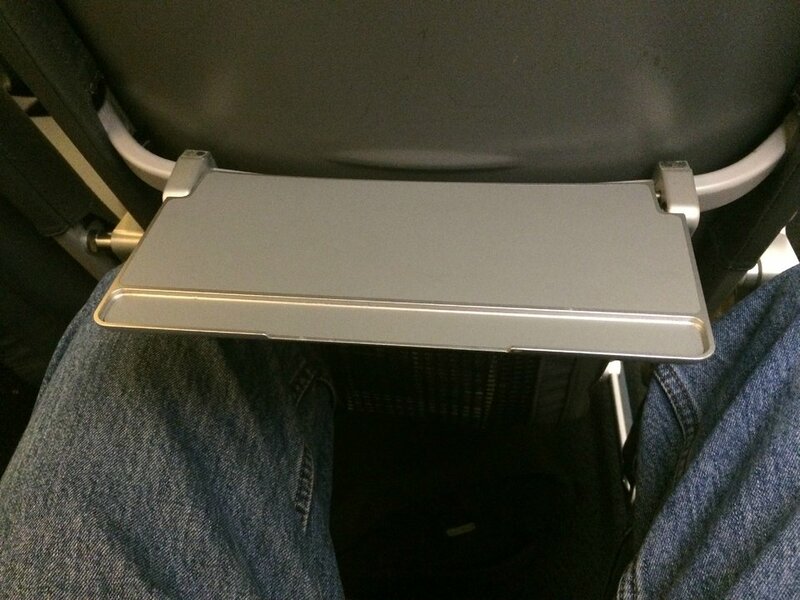 The tray table is about 4" x 9". There is no power or audio. The width of the seat is narrower than most. The only free thing you can get is a cup of room temperature water, no ice. Pop costs your $1.99/including ice and a cup. If you are flying less than 2 hours, maybe the suffering will be okay. This flight was over 3 hours with all the sitting from loading, etc. Knees were killing me. There is so little leg room because they have the under seat storage bar set back about 4" less than other airline seats. Seat 2C (and rows 2 - 4, which all should be yellow) has overhead space issue on A320. Rows 1-4 are "Stretch Seats" for which you pay extra. But, because the overhead bin above row 1 is obstructed by an airplane system (some type of pressurized tank), flight attendant will instruct rows 2 and 3 to put bags over row 4 to leave clear for row 1 (causing any overhead "domino effect" throughout plane). Upon landing can be very annoying to retrieve back against exiting, aisle traffic. You get what you pay for. Dont expect some luxurious dinner service on one of there flights. If you pay for an extremely cheap seat, you dont get alot. The crew was extremely nice and young. YOU GET WHAT YOU PAY FOR. Yes it's not a very comfortable plane and yes Frontier is not the most passenger friendly airline. But if you are on a tight budget and have to book with Frontier, DO NOT COMPLAIN. This is an excellent aircraft that will get you from point A to point B. If you expect your seat to be first class, fly with JetBlue or something along those lines. All in all, a good flight, made it there on time, and most importantly, in one piece. 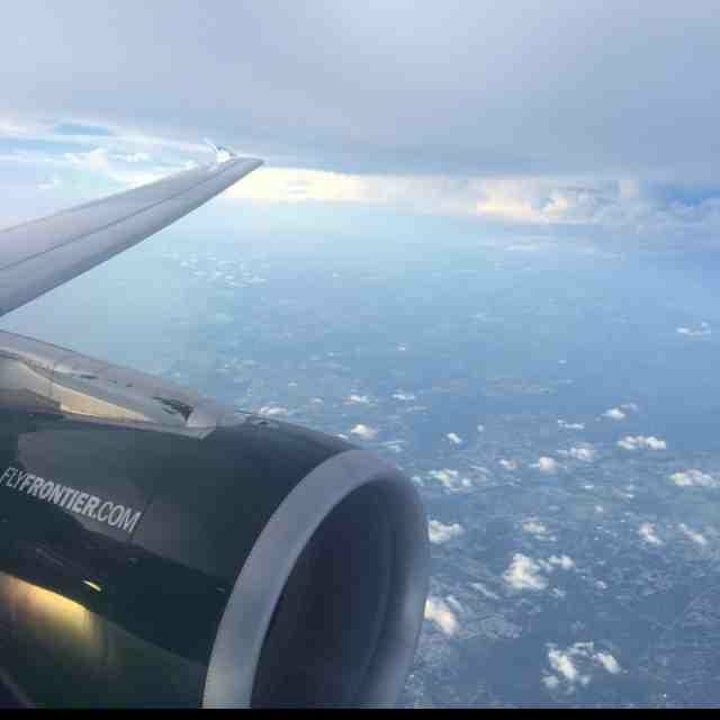 This is my first recent experience flying Frontier. They want to make you pay to get a seat assigned.....they want $25/carryon. I have not even flown yet, but I can already tell this will be a one time experience. I'd rather fly a mainstream airline that doesn't try to nickle and dime you to death. Seats in row 4 should be marked as be aware or mixed review. These seats contain additional leg room, but are in front of seats which have standard leg room. This results in people behind pushing their legs into the back of your seat. Seats in rows 1-3 do not have the reduced leg room behind them and are much less likely to experience customers pushing their knees into the seat back. If you are interested in an exit row seat but also may need a seat belt extender...forget it on Frontier. They will not permit the use seat belt extenders on any emergency exit seats...at least in the A320's. This has to be the absolute worst and most uncomfortable flight experience I have ever had. I was never told that the seat would not recline. When seat 9A was reclined, it's headrest was approx. 8 inches from my face. The flight attendant had to ask the person in 9A to sit up a little so she could hand me a glass of soda. And, on a four (4) hour flight you are not even offered a snack. You have to purchase everything except a small glass of soda or water. I will never fly under these conditions again. Frontier, you are not passenger comfort friendly. Frontier flies 2 versions of Airbus A320.